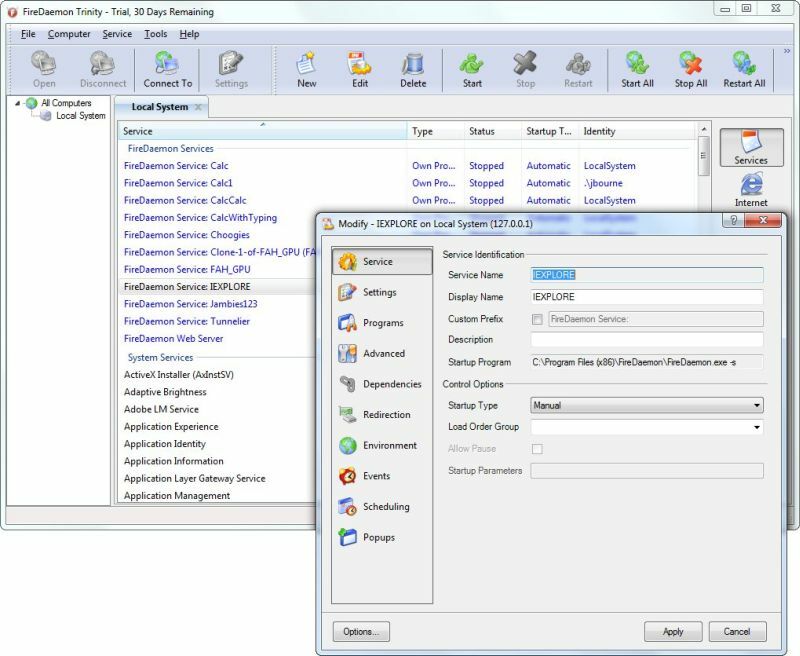 FireDaemon Trinity is an Windows Service Management Platform. FireDaemon Trinity is comprised of three components: Enterprise Management Console, Web Server and Console Application. The Management Console gives you control over services running on all machines on your network. The Web Server allows you to manage services via web browser or remotely manage via SOAP. The Console Application allows you to run any application as a service. ...... service status via RSS. The Console Application allows you to run any application program executable as a Windows service. This is typically configured from the Enterprise Management Console but can be configured by creating XML files defining the service and installing via the command line. FireDaemon Trinity allows you to run any 32-bit or 64-bit application (EXE or DLL) or script (BAT CMD, .NET, Perl, Java, Python, TCL TK) as a XP, 2003, Vista, 2008 or 7 service. Trinity requires the Microsoft Windows .NET 2.0 framework (for Management Console and Web Server). FireDaemon Trinity allows you to securely create, manage and edit windows services on your local machine or network or across the Internet. * Create and manage FireDaemon and other services on your local or any remote machine. * Securely connect to and manage all Windows services on any remote machine. Qweas is providing links to FireDaemon Trinity 2.4.2675 as a courtesy, and makes no representations regarding FireDaemon Trinity or any other applications or any information related thereto. Any questions, complaints or claims regarding this application FireDaemon Trinity 2.4.2675 must be directed to the appropriate software vendor. You may click the publisher link of FireDaemon Trinity on the top of this page to get more details about the vendor.